Marlene is a cooking host currently battling breast cancer and looking to drive a new revolution of food for our families by "cooking once, producing twice". Oh dear it's been a few weeks and I've been so absorbed with the cookbook that I've forgotten to keep you all updated! As we wind up the content for the book and get ready to send everything off to the graphic artist in a few short days, I can tell you that the layout is fantastically unique, the cover is a riot and we have all had so much fun putting this together. 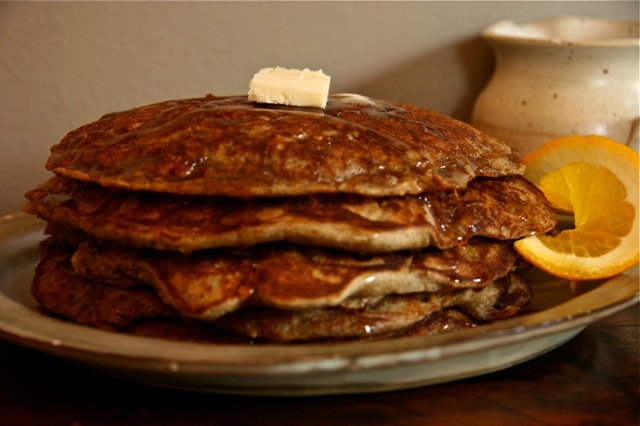 Check out this great photo of Oatmeal Cookie Buckwheat Pancakes! If you're wondering what in the world these are, they are part of a fantastic new trio that takes heart-healthy oatmeal and creates amazing cookies, then uses some of the cookie dough to create these hearty pancakes and with the baked cookies, we've also created ice cream sandwiches - voila, a perfect trio for oatmeal! We are so busy constructing Cook Once Produce Twice recipes and I hope our viewers are going on line on a regular basis to look at the new content we are adding. Soon we will have a search engine with more recipe content when we launch our new website in November. Have you tried Kale? Kale is full of vitamins, the dark leafy green we need in our diets...and our kid's diets. Kale is believed to help aid against cancer which puts it at the top of our list in the mmm test kitchen. Due to popular demand we added this recipe last night instead of waiting for the webisode so look for "Fueled Fit and Fabulous" and you will find an amazing new snack with kale....Gluten-free, all vegetarian and extremely healthy. Well I return to the blog.....yes this is Marlene and I am having a wonderful day finally able to stay in my office and enjoy a coffee and speak with all of you! Health has continued to become a major topic, maybe in some way we are all realising the part that we play and that we are teachers for our children and the next generation. I read a sign yesterday outside of a church that said, "your home is a school.....what are you teaching"? I keep thinking about this as it relates to Dakota and the messages I send each day intentionally or not. I want to do better for her and as much as our kitchen table has done well it is time to work on friendships past and present and decide how I want to improve and make sure Dakota watches my mistakes, yes my mistakes.....but more importantly how I handle them! So, sorry for anything or anyone in my past, but I am ready and geared for tomorrow......happily making mistakes along the way. Come join me this weekend, your support is always appreciated and your health will thank you too! The creation of the cookbook is well underway and as we write, cook, test recipes, and write some more, we are finetuning our "look" and I can promise it is going to be a feast for the eyes and senses! It's definately a unique book and one I am certain one you will love. We are creating a seasonal theme with recipes by the month. We are collecting some beautiful photos along the way and we'll start giving you some sneak peeks into what the cookbook will look like. Stay tuned for some sneak peek photos of some of our fabulous new dishes, coming soon! If you're wondering why the posts have been a little "light" over the past few weeks, don't be dismayed! We have been meeting a lot and working even more on a cookbook to capture this seasonal approach to cooking with Marlene's "Cook Once, Produce Twice" concept! Teaming up with another cancer survivor, Robin MacMillan, as our food photographer, the project is kicking into high gear and deadlines are being set. We are looking at a pre-Christmas release of the cookbook so keep visiting the blog as we share our journey with you. As we get closer to a publisher date, we will let you know the title, release date and where you can buy one! Stay tuned for lots of exciting developments over the coming months! Run, walked, laughed and even cried just a little this year.....what a wonderful event. The mmm team soared across the finish line with over $8,000.00 in donations and great team spirit. Dakota happily finished the full 5km's by starting with running in mind then quickly deciding to finish by walking over the finish line.....great job D!! Our good friend's Chyvonne and Al treated everyone to their famous chilli in a bread bowl and opening up their home with a roaring fire....what a way to warm-up with such a cold start to our day. Devon from the mmm team did not let us down....with brisk temperatures and students all eager to help, she joined in at the Nipissing location and supported the run from her campus.....nothing like a little satellite run competition. We attached some of Devon's photos to share in the spirit.......looks like the colour pink crossed over to Nipissing....thanks Devon for a great job. While we tend to support events to raise money for hospital equipment or research on how to better fight cancer, what we all need to be thinking about more is how to prevent it ourselves by taking ownership of our own lives. As a fellow survivor, I know that is what connected Marlene and I right away. Not our need to commiserate about chemo or the horrors of losing a breast... but how to educate people about developing a healthier lifestyle with less toxins, less preservatives and less cancer-causing elements in general. Eat clean, protect the environment and be active. As the moto goes: Good things happen in Threes! Why do I run? Because I'm still here. Because I am better and because I can. Last year I was too sick to run so I gave generously to a friend doing the run but this year it's my turn to step up again. This year I will run for myself, for Marlene, for all of the courageous women who have fought cancer but most of all, I will run for my daughter Sydney and her future. I run to set an example to my children about the importance of giving back. And I run with the hope that the next generation will be less than "1 in 9". Please support our team this weekend and help aid the research to finding a cure. 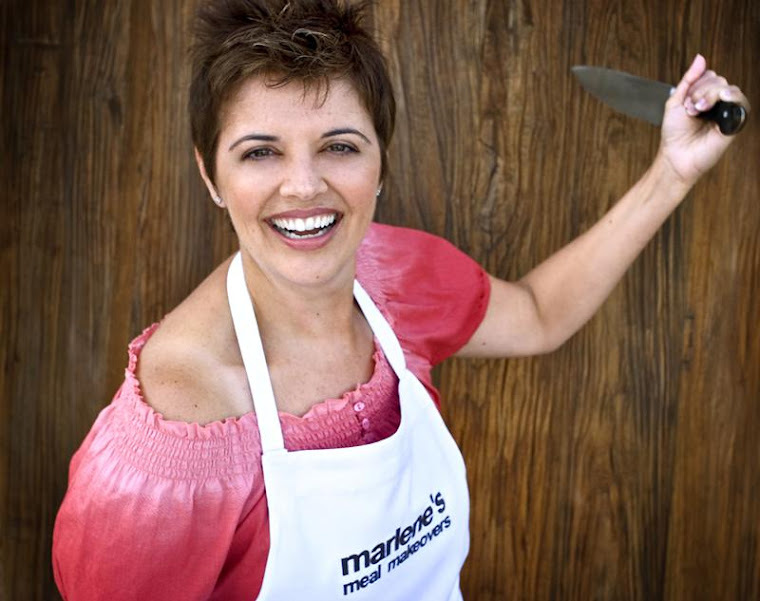 Marlene the host of marlene's meal makeovers is on a mission since being diagnosed with breast cancer, to ensure families return to their kitchens with her revolution of cook once, produce twice. These are simple techniques to ensure we get healthy food on our tables with stress free tips and recipes.